Through our workforce liaison meetings it was suggested that we planted some plants around our depots as a mark of respect to those in our industry that had unfortunately lost their lives or been seriously injured while at work. We discussed this with our workforce and it was decided that we would go a bit further than that and allocate a part of one of our quieter depots (Ower depot on the M27) to be made into a small memorial garden. We decided that this garden would be called the International Workers Day Memorial Garden to also mark that annual event. The purpose of the garden is to be a place for any of our workers to go to have a spot of time to themselves for reflection or a bit of peaceful time. It was also decided by ourselves that we will place small brass plates on the fence rails to commemorate any staff who have served on our contract who may of passed away as a memorial to them. The garden was constructed over a few weeks by volunteer members of our workforce and they utilised any building materials we had available. 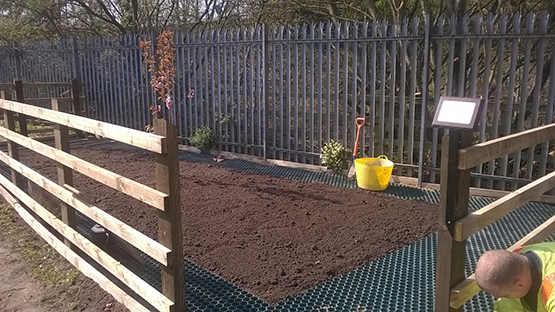 The plants and trees that have now been added were donated by Kier personnel.